“Indeed ahead of you is the blessed month of Allah. A month of blessing, mercy and forgiveness. 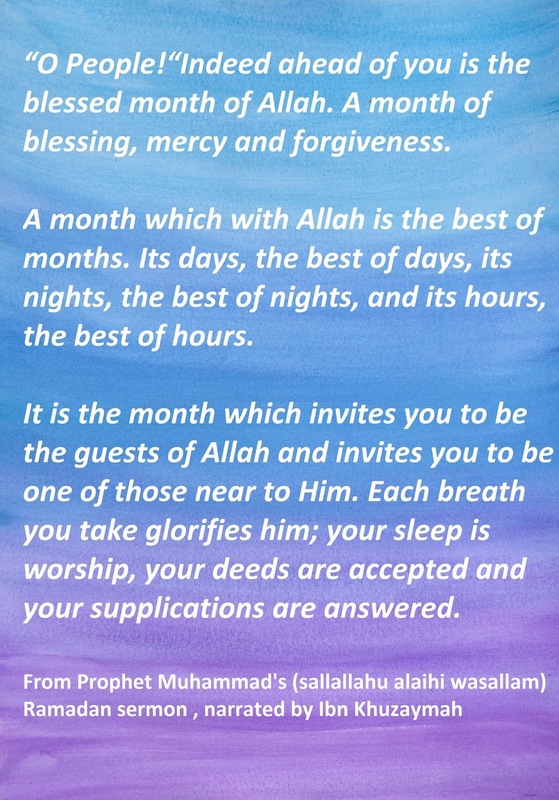 A month which with Allah is the best of months. Its days, the best of days, its nights, the best of nights, and its hours, the best of hours. 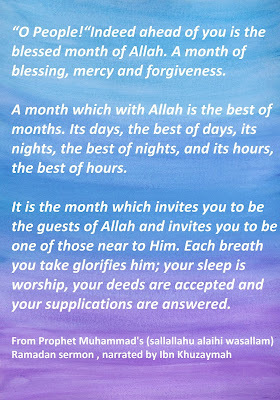 It is the month which invites you to be the guests of Allah and invites you to be one of those near to Him. Each breath you take glorifies him; your sleep is worship, your deeds are accepted and your supplications are answered. So, ask Allah, your Lord; to give you a sound body and an enlightened heart so you may be able to fast and recite his book, for only he is unhappy who is devoid of Allah’s forgiveness during this great month. Remember the hunger and thirst of the day of Qiyamah (Judgement) with your hunger and thirst; give alms to the needy and poor, honour your old, show kindness to the young ones, maintain relations with your blood relations; guard your tongues, close your eyes to that which is not permissible for your sight, close your ears to that which is forbidden to hear, show compassion to the orphans of people so compassion may be shown to your orphans. “O People! Indeed your souls are dependent on your deeds, free it with Istighfar (repentance) lighten its loads by long prostrations; and know that Allah swears by his might: That there is no punishment for the one who prays and prostrates and he shall have no fear of the fire on the day when man stands before the Lord of the worlds. “O People! One who gives Iftaar to a fasting person during this month will be like one who has freed someone and his past sins will be forgiven. “One who covers the faults of others will benefit in that Allah will curb His anger on the day of Judgement. “As for one who honours an orphan; Allah will honour him on the day of judgement. “And for the one who spreads his kindness, Allah will spread His mercy over him on the day of Judgement. “Whoever performs an obligatory prayer Allah will reward him with seventy prayers [worth] in this month. “And who so ever prays a lot during this month will have his load lightened on the day of measure. “He who recites one verse of the holy Quran will be given the rewards of reciting the whole Qur’an during other months.